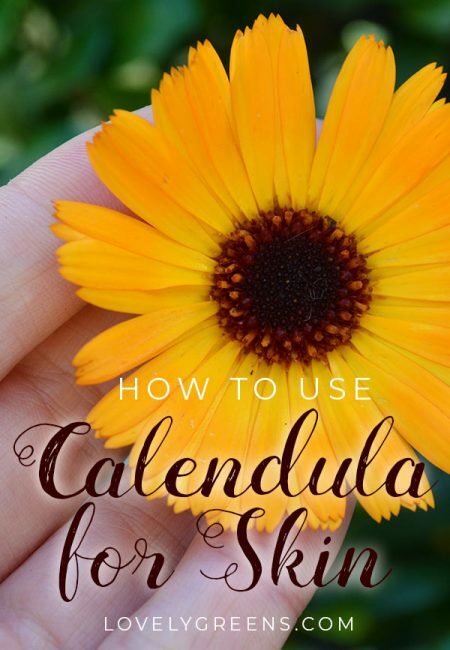 How to use calendula flowers for skin and healing skincare. 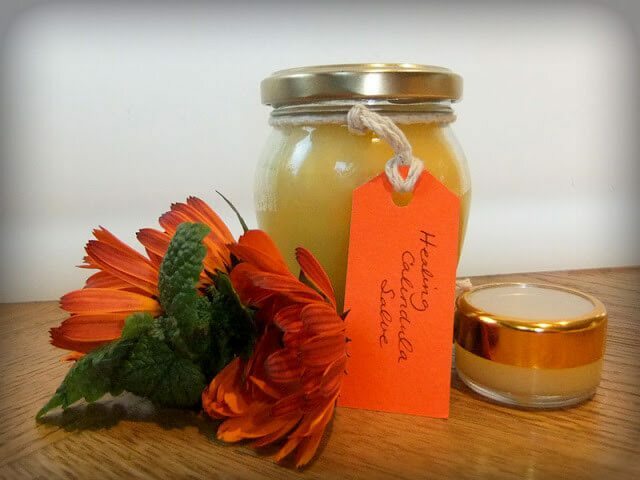 Shown to have powerful skin healing properties, calendula’s compounds can be easily extracted and made into homemade ointments, balms, creams, lotions, and soap. This is part of the growing calendula for beauty, health, and food series. Calendula officinalis, also called the Pot Marigold, is a cheerful garden plant that produces continuous blooms of golden flowers. It’s also probably the most useful garden flower to be had. Its flower petals are edible and you’ll often find them in fancy salads or recipes for edible flower cakes and desserts. They have a slightly peppery flavour and the yellow-orange of their petals can naturally color food. The ‘pot’ in Pot Marigold refers to its use in the kitchen. However, the most exciting use for calendula is in healing skincare. The flowers are antiseptic, anti-inflammatory, anti-fungal, anti-viral, and anti-bacterial and have been shown to help speed up the healing of skin. These properties make it a great ingredient for soothing, natural skin products. 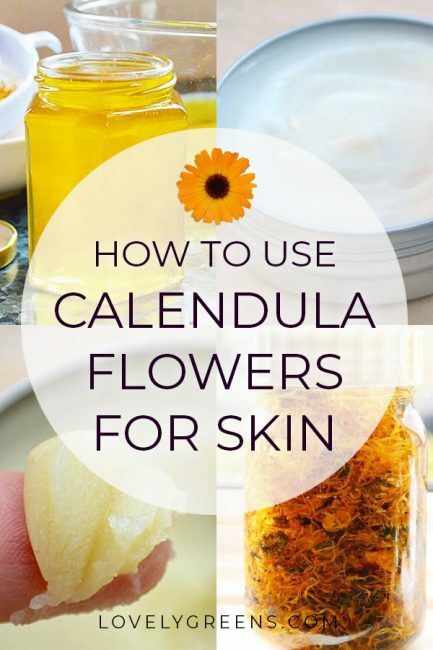 Probably the biggest question you might have right now is how to actually use calendula flowers for skin. 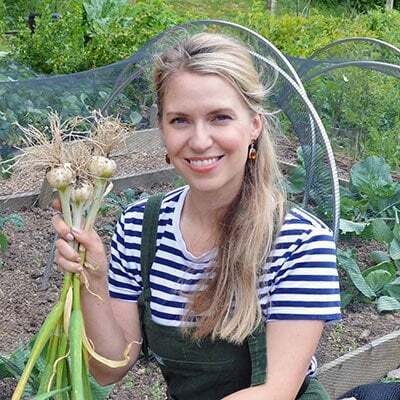 This piece, along with my additional calendula pieces and recipes, will help you learn how to grow it, harvest it, and use it in natural skincare. Calendula most likely works by helping wounds to quickly form granulation tissue. This moist red to pink tissue closes the wound, protects the inner tissues from infection, and begins the healing process. Aside from cuts and wounds, calendula helps soothe and heal burns. Its anti-inflammatory properties reduce pain and swelling. There is also a promising study that shows that calendula can reduce the growth of tumors. Is calendula safe for everyone? Generally speaking, calendula is typically very safe to use for most adults and children. That means that you can use calendula flowers for skin complaints in toddlers up to seniors. However, calendula is part of the Asteraceae family and some people can be allergic. If you’re sensitive to ragweed/ragwort, chrysanthemums, or daisies then please be cautious. Calendula is also considered unsafe for pregnant women or if you’re breast feeding. The quickest way to get calendula flowers is to buy them. I’ve seen them sold fresh a few times at farmers markets but online or through health food shops you’ll tend to get them dried. That’s perfect because in many cases you need dried flowers to start making beauty products. On packaging calendula will simply be listed as ‘Calendula officinalis’. There are about 100 cultivars though and the varieties that are best for skincare are types higher in resins. Erfurter Orangefarbige and Resina are excellent choices but it can be difficult to get this information. If you’re lucky you might be able to get the cultivar’s name from the supplier – especially if they’re a small-scale grower or herbalist. 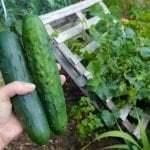 If you’d like to ensure that you’re using a medicinal variety then it might be better to grow it yourself. Fortunately, growing calendula is very easy. It does need an outdoor situation but that could be a window box, container, flower bed, or in the garden. Not only can you harvest their golden petals from spring until early winter but they add decorative color and cheer. 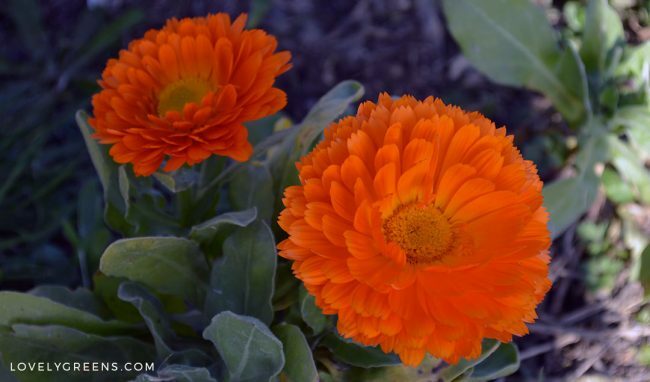 Get started by reading the complete guide to growing calendula flowers. There are several ways that you can get the healing compounds in calendula onto your skin: as a poultice, compress (tea), or as an infused oil. The last two can be used to make more conventional skincare products like salves, creams, and lotions. You can use calendula petals whole by making a poultice. Poultices are mashed up herbs and leaves that you lay directly on the skin and hold in place with a bandage or cloth. They’re useful for treating large areas of skin inflammation such as a rash from nettles or a sunburn. 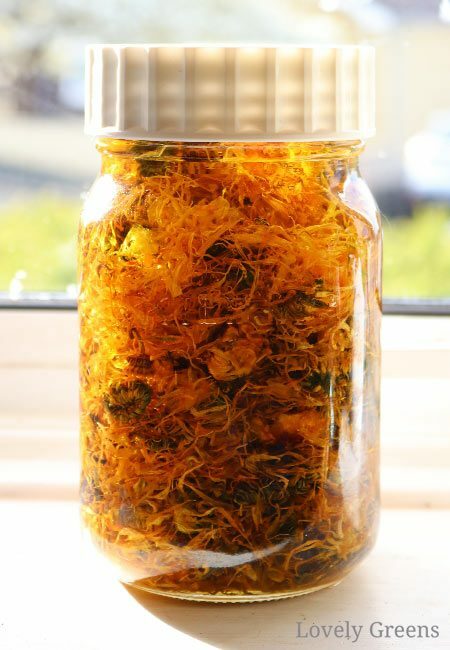 Poultices are also quick to make if you have a jar of dried calendula at the ready. Make a basic calendula poultice by using enough fresh or dried flower petals to cover your skin in a 1-2mm layer. Mix the petals with a small amount of hot water and mash it up. 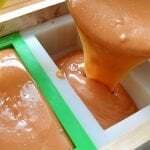 Pulverizing it with an immersion blender can release even more of the extract and make a kind of paste. Spread or smear the poultice on, attach a bandage to hold it in place, and leave on the skin for up to a few hours. Afterwards, rinse it off, dry the skin, and apply a balm or ointment. 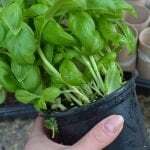 While poultices are a great solution for your herbal first aid kit they’re not for every day use. It’s cumbersome and unnecessary to wear a poultice unless you have major inflammation. For daily use it’s better to apply ointments and balms for minor issues that need protection. To treat acne and herbal skincare it’s best to use a water-based product like a lotion or cream. The benefit of these products is that they’re less awkward to have on and thus can stay in contact with your skin for longer. 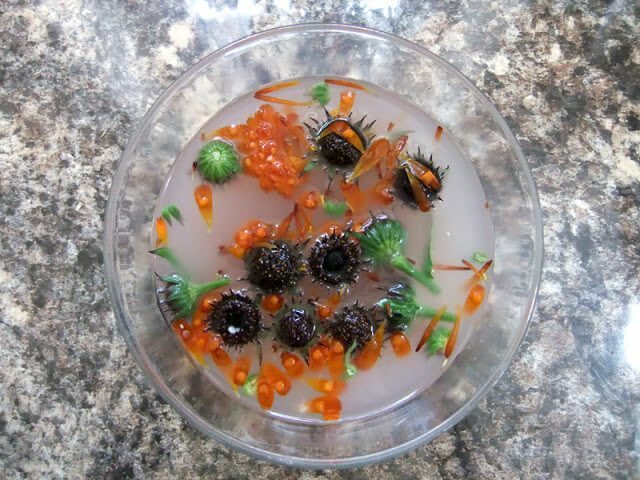 To make any of these you need to first extract calendula’s compounds into another substance. Fortunately, calendula is both water and oil soluble. That means you can infuse it into water, another liquid, or the oil of your choice. Compresses are an infusion that you apply to your skin using an absorbent cloth. They’re a good way to soothe skin inflammation and rashes in the case that you need to put together something quickly. Make one by seeping 3 teaspoons dried calendula flowers heads or petals (or 6 teaspoons fresh) in a cup (240ml) of scalding water. Leave to infuse for 10-15 minutes, then strain the flowers out and discard. It’s the liquid you want at this stage and it’s best to use it fresh. Soak a cloth in the tea, wring it out, and use it to cover your face or any other parts of your body that need some relief. Leave on for ten minutes or until the cloth starts to get cold. Use a calendula compress from twice a week to daily. If you have leftover liquid, you can store it in the fridge for up to three days if you’d like to use it again later. The infusion you make for a compress is essentially a tea, and you can make it on a larger scale too. Place up to a cup of dried flowers in a reusable cotton tea bag (or a sock) and let it seep in your hot bath water. Alternatively, you can make a pot of strong calendula tea and pour it in the bath. Oatmeal is another great additive to add to warm baths, especially to soothe sunburns. Years ago a friend was terribly burned and the only thing that soothed his skin with immediate relief was an oatmeal bath. If you’re in the same scenario, put a cup of oatmeal along with up to a cup of calendula in a bag/sock and infuse it in your bath water. Swishing it around will release a stream of milky calendula-oatmeal goodness. You’ll sigh in relief once you climb in. Lotions and creams are made mainly of water. Usually it’s distilled water but you can substitute calendula tea as part or whole of most any recipe. Make in the same way that you would for a compress and blend it together with an emulsifier, oils, and other additives. You can also use calendula-infused oil to make your creams and lotions. 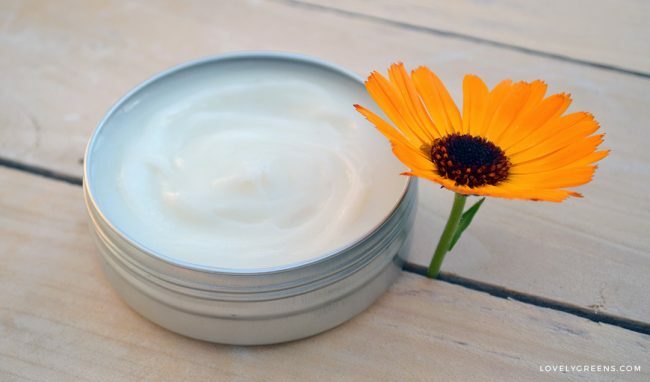 Here’s a calendula lotion recipe to get you started. 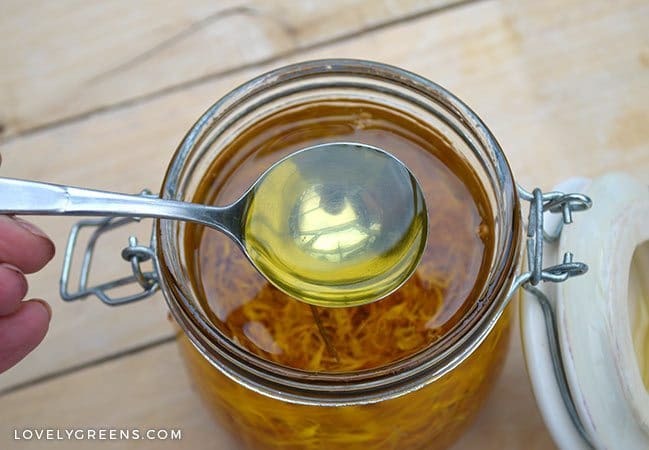 One of the best ways to prepare and preserve calendula is in oil. When seeped into light oils such as grape seed or sweet almond, the petals release their healing properties and color into the liquid. 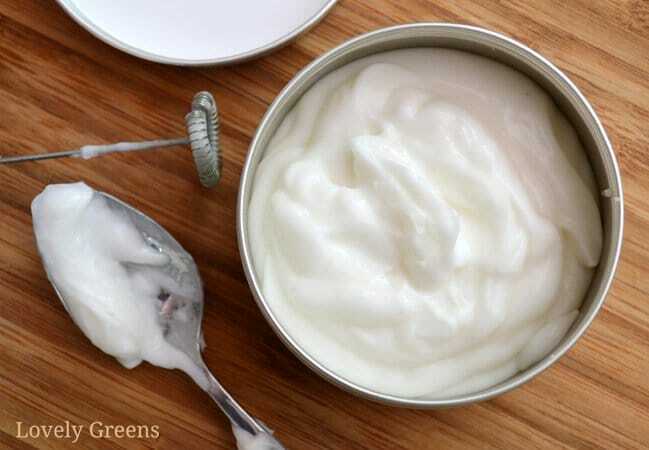 You can then use the oil to create lotions, creams, balms, salves, or to use neat on the skin. 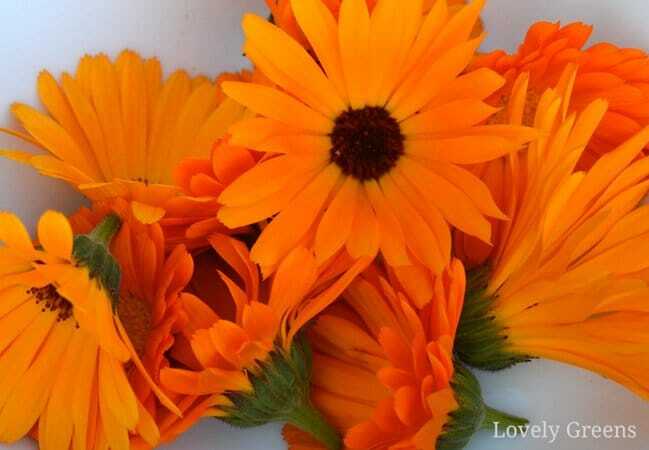 To make calendula oil, fill a glass jar with dried calendula flower heads and/or petals. Then fill the jar with liquid oil until the flowers are submerged. Seal and place in a warm, sunny window for 2-4 weeks and remember to give the jar a shake every couple of days. Placing the jar inside a brown paper bag is optional but can help protect the oil from UV light. The type of oil is up to you. My favorite is sweet almond oil but you could also use grape seed oil, sunflower oil, apricot kernel oil, or even olive oil. Look for one that has a shelf-life of at least a year. When the time is up, strain the oil from the flowers — the dried flowers will have absorbed a lot of oil so make sure to squeeze it to get every last drop. Bottle into dark glass jars and store in a cool and dim place. Calendula oil is good for up to a year. Make sure to check the shelf-life of the oil you use though first – if it expires in three months then your calendula oil will only be good up until that time too. Calendula salves are oil-based skincare made with calendula-infused liquid oil mixed with melted solid oils. It’s then poured into containers and solidify into a semi-solid form. You scoop it up and massage it into the skin wherever you need healing action or soothing. To make calendula salve mix one part by weight solid oil or wax (beeswax, soy wax, or cocoa butter) with eight parts calendula oil. For example, 20g (0.7oz) of beeswax with 160g (5.6oz) calendula oil. 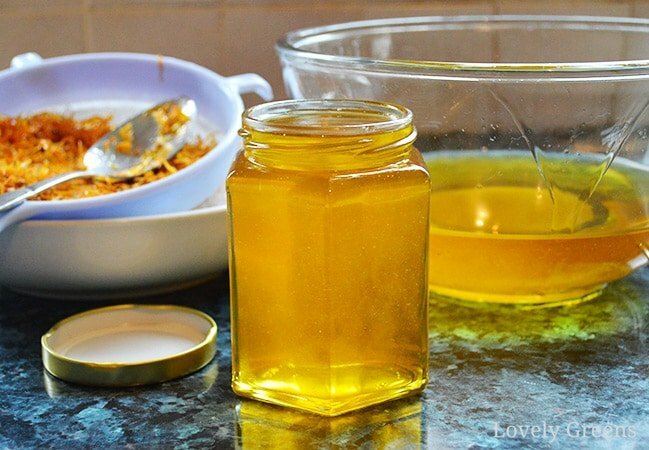 First melt the solid oil using a double-boiler, pour in the calendula oil, stir well, pour into containers and allow to cool. Calendula salve can keep for up to two years or by the closest best-by date of the ingredients you’re using in your batch. There’s no literature that I’m aware of that shows that the medicinal properties of calendula survive in handmade soap. 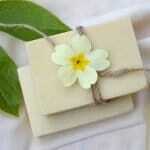 At least if you’re making soap using just the flower petals. The benefit that I see in calendula flower soap is the color. 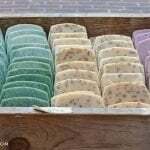 Most flowers will darken when used in soap making and it’s disappointing to see once vibrant lavender buds or rose petals turn brown. 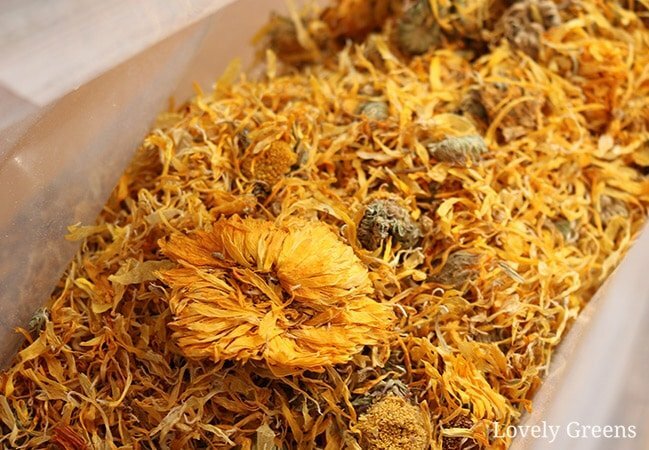 Calendula is different in that it maintains its sunny yellow or golden orange hue not just through the soap making process, but for months afterwards. For that reason alone, calendula is one of my favorite natural soap colorants. 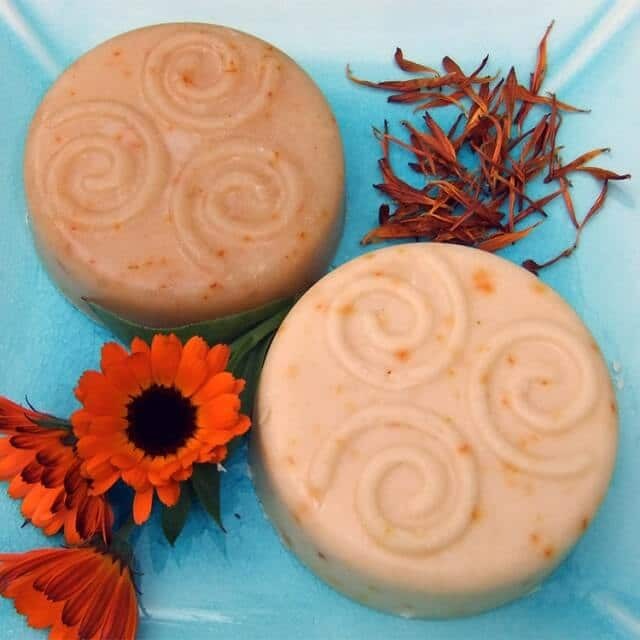 I share a calendula soap recipe here. Simply nice Tanya ! I like the way you have guided us with this article. Thanks for sharing ! Thanks for all info that you offer here. Each part of Lovely Greens is well-rounded with satisfactory info for any beginner/professional people. Thanks for linking my recipe Tanya. I adore Calendula and keep promising myself I’ll try making hand cream with the flowers but haven’t managed it yet. Now I have even more ideas for this colourful plant! Gorgeous images too. You’re so welcome Dee and thank you for your great piece! 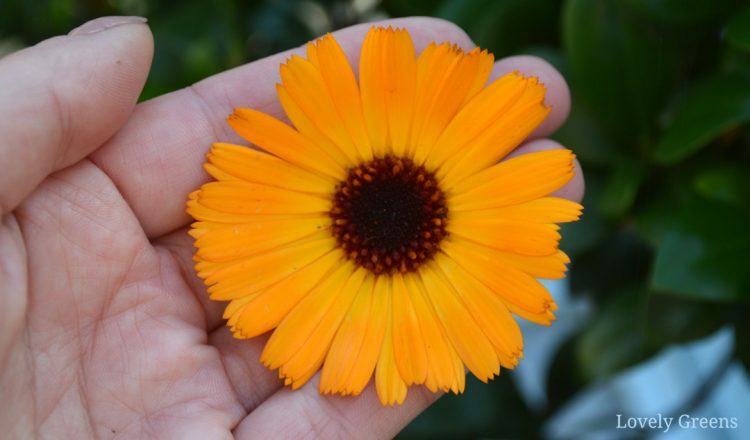 How should Calendula be fertilized to make certain they are healthy and nutritious? 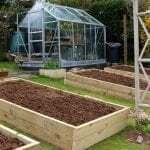 They really don’t need much in the way of fertilizer Terry – soil that’s had compost/manure dug into it would be perfect! Thank you for all of the wonderful information. I can’t wait to try and grow some.